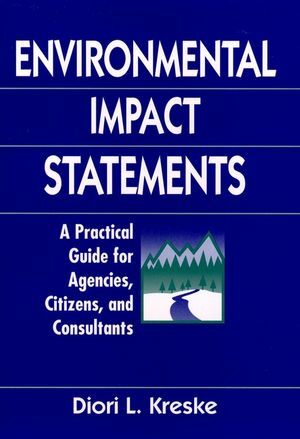 Environmental Impact Statements focuses on the roles of the variousparticipants in the EIS review process. Whether you are an EISauthor or reviewer, member of a public agency, a private sectorconsultant, a developer, environmental activist, or privatecitizen, understanding your own role and the roles of others in theprocess will increase your effectiveness, reduce duplication ofeffort, and save time and money. This hands-on guide offers a unique, comprehensive approach topreparing, managing, and reviewing an EIS. It chronicles thepreparation process step by step, from kickoff meeting throughfinal submission and, unlike other books, it integrates technicaldiscussions on the regulatory environment and impact analysis intothe planning chronology instead of treating them independently. Thebook's combined emphasis on process and interaction of rolesenables participants to adapt each step to their own federal orstate EIS projects. Author Diori Kreske explains all concepts needed to understand theEIS process and presents them first at an introductory level andlater in greater detail. In the first half of the book sheintroduces readers to the EIS process, defines the roles andresponsibilities of major participants, and discusses the processin relation to federal and state requirements and court decisions.Then Kreske concentrates on the nuts and bolts of preparing andmanaging an EIS. She describes how to build an EIS team, establishthe statement's framework, manage the preparation process,determine when and how to involve the public, and write and reviewEISs. Whatever your role in the EIS process, and wherever your interestslie, this invaluable resource will help you develop a clearunderstanding of your responsibilities within the definedrequirements and ensure that the process will be more effective inaccomplishing its stated purpose: to reduce the negative impacts ofour actions on the environment. For anyone involved in the EIS process, this unique resource willmake you a more effective participant and help you produce a moreaccurate, reliable, and effective EIS. DIORI L. KRESKE has worked for over twenty years in the environmental impact statement field, as both a team member and an interdisciplinary team leader while with the U.S. Departments of Interior, Agriculture, and Defense, and as a private consultant. She has prepared and managed federal and state EISs and provided EIS training to staff members, management, and military officers. Overview of Federal, State, and Other Nations' EISs. Reducing Time, Effort, and Paperwork.